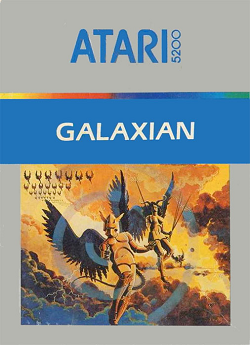 In this review, we take on alien forces in the Atari 5200 game Galaxian. We find out if this is a good top down shooter. This game was released in 1982. It is another port from the arcade game. We previously reviewed the Atari 2600 version and found it to be pretty good. So, we decided to try another port of this game to see if it was equally entertaining. In this port, the similarities between this and Space Invaders is quite evident. You fight against waves of aliens floating around. One key difference is that the aliens actually break formation and fly down towards you. You can not only die from the bullets they fire, but also colliding into them. The good news is that the ship is very maneuverable. It can move quickly left or right to get out of some tight spots. Unfortunately, the aliens are also very maneuverable. When they break formation, they can hold their spot part way down and try and shoot you as well. This certainly gives this game some added extra challenge. If you beat a wave, you are awarded a flag. This brings us to one downside of this game. Every wave has the aliens retain the exact same formation. The difference seems to be that more aliens can attack you in later waves. You get three free lives. If you manage to get 5,000 points, you’ll win an extra free life. Logically, I thought I would get a free life every 5,000 points, but when I reached 10,000 points, I never got an extra life. So, I don’t know if that is the only free life you get or if you need to earn even more points for the second free life. Generally speaking, the game play has that simple, but fun vibe. Unfortunately, because the levels don’t change with each wave, the game gradually becomes repetitive after a while. There is that addicting nature where you want to get a higher and higher score, but that too fades after a while. Graphically, this game is an improvement over the other port. The aliens are more clearly drawn out and the ship is also better looking. The flags and free life indicators do leave a lot to be desired and the sparse star background does get old after a while. The sound is rather basic. There’s no real music (the intro is just a few basic notes) and the sound effects are fairly straight forward. Nothing huge to be had here. Overall, this was an OK game to play. There is that addicting nature of trying to get a higher and higher score. Unfortunately, play is rather repetitive with the fact that you are basically fighting the same wave over and over again. The graphics are OK, but the background and aliens never really change. There isn’t any real music and the sound effects are pretty basic. So, I would say this is a decent distraction for a while, but a game that does get old after a while of playing. Furthest point in game: Wave 6: 10,900 points.